Want to be notified of new releases in mustaqmustu/openfoodfacts-androidapp12? Pull request Compare This branch is 207 commits behind openfoodfacts:master. What is Open Food Facts? Open Food Facts is a database of food products with ingredients, allergens, nutrition facts and all the tidbits of information we can find on product labels. Open Food Facts is a non-profit association of volunteers. 8000+ contributors like you have added 700 000+ products from 150 countries using our Android, iPhone or Windows Phone app or their camera to scan barcodes and upload pictures of products and their labels. Data about food is of public interest and has to be open. The complete database is published as open data and can be reused by anyone and for any use. Check-out the cool reuses or make your own! Have a bug or a feature request? Please search for existing and closed issues. If your problem or idea is not addressed yet, please open a new issue. Android Studio should be the latest stable build. 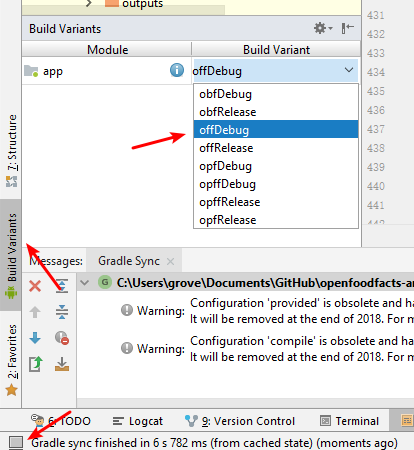 If you're running the app for the first time, Android Studio will ask you to install the Gradle dependencies. Big thanks to their contributors! If you're new to open-source, we recommend to checkout our Contributing Guidelines. Feel free to fork the project and send a pull request.